Back in July 2013, I reviewed the first book in Stephen Martino’s Alex Pella trilogy. At the time, I was struck by the novel’s fast-paced action thriller approach to telling a captivating story that included very strong overtones to our then-current political environment. The Hidden Reality is the second installment in the Alex Pella trilogy and is a true successor to The New Reality in both its tone and style. Just as with the first novel in the series, The Hidden Reality drops the reader directly into the action and moves at a fast pace to jump start the story from the very first page. If you are looking for a story that has a sleepy opening and then slowly lumbers through chapter after chapter until something major happens, then this is not the book for you! The Hidden Reality starts off hot and keeps the temperature up throughout the entire novel. Fast-paced, action-packed storytelling aside, if you are looking for a novel that has compelling characters that you actually care about and can become emotionally-invested in as you read, then The Hidden Reality is your book. In fact, one of the primary reasons that I could not put this book down was because Martino writes characters that I could relate to and whose stories I wanted to read. His characters mean something to the plot and are not just throwaway placeholders or MacGuffins. Alex Pella, for example, is a hero that you want to cheer for; he’s someone that you want to see win in the end because he awakens the best parts of how we see ourselves. Putting aside the main character for a moment, the novel has additional characters who are absorbing – and for different reasons. Without giving away any of the major plot points, in the beginning of the novel a character named Jules laments to his fellow board members that their corporation is so large and so omnipresent in the lives of everyone on the planet that it has rendered humanity weak and somewhat mentally-stunted. He goes into a diatribe about people no longer having the fortitude or desire to rise up against these types of overwhelming power structures because they rarely think any more. As a reader, I found myself considering the many times that I have felt the same frustration as Jules. I thought about the times that I have passionately implored people to wake up to what is going on around them only to realize that I am stuck talking to people who are mostly wearing blank stares on their faces. It is not a fun experience and I uniquely understood how Jules felt in that moment. 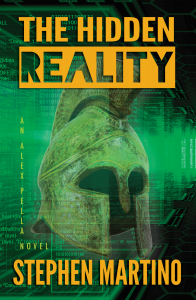 The brilliance of The Hidden Reality and of the entire Alex Pella series, though, is the deep connections that Martino’s dystopian future has with the often scary revelations that are becoming far too common in our own world. When our Internal Revenue Service was used as an attack dog for political purposes and the most prolific website on the internet (Facebook) is rolling out updates to its face-recognition software and strongly encouraging its more than one billion users to play along, one has to wonder how close we are to achieving Martino’s hidden reality today. 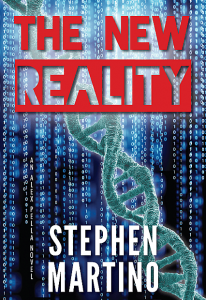 The Hidden Reality features a global organization that can track anyone’s location based on their subatomic wavelengths, individuals who place implants in their eardrums to communicate, and the fusion and evolution of corporate behemoths into a global government. Are we really that far away from any of these headlines being published in our own media and in our own time? The Hidden Reality combines a dystopian future with the mental rigor of a medically-augmented and futuristic plot to create an action-packed story that is fun to read and hard to put down. If I were publishing this review during the summer months, then I would strongly recommend you pick up a copy of this book to read while you are relaxing on the beach. As we are in the doldrums of winter, though, I cannot think of a better book to read while snuggled up by the fire on a cold winter day. When the temperature drops outside, I highly recommend you kick it up a notch inside by jumping into the Alex Pella series! Incidentally, this was the first e-book that I read on Amazon’s Kindle app. I do not really have any complaints about the Kindle platform. In fact, I think it worked out pretty well considering that I had the Kindle app install on my Samsung Nook tablet (weird, right? ).